of my plein air carrying box! - the subjects I love. These people must get a lot of mail. This has a sturdy post and big box. Great work, Julie. It looks very southwestern. In terms of the size of the mailbox, I doubt that anyone gets a lot of actual mail any more. Remember the days when you looked forward to receiving a letter? An envelope with real stamps! If it came from overseas the tell tale stripy envelope. They were good days! Thank you David. You make a good point about the change in mailing habits. The air mail letter meant i was hearing from friends and family. Very exciting. I have the link to your amazing birding/ nature blog on my side bar and my hats off to you and Miriam getting out in sub zero weather. Hi Hilda. Thank you. I am happy you too like the southwestern colors. Your portrait of Sierra is special. You have been painting her since she was three... wow. A warm and lovely scene, with that delicious blue gate -- it's utterly irresistible! How delightful that you found this little gem tucked away in your paintbox!! 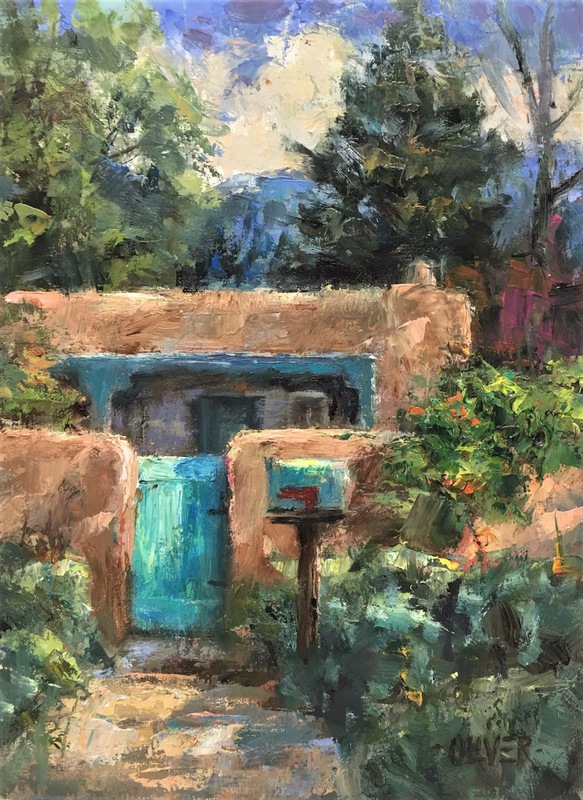 Looks like a very cosy place, love the eye catching turquoise door and the light hitting the entrance , gorgeous painting ! no mail boxes here really, unless you live far out in the sticks. I love the light on the gate and the adobe! Love the colors too. Maybe the owners get a lot of junk mail. lol That is about all that fills my mailbox besides bills. Julie I can't imagine anything being more lovely. 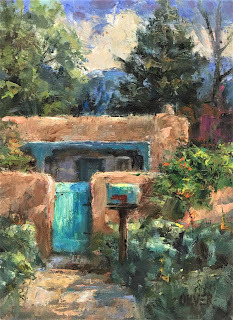 I love that blue gate next to the adobe colors in the home. Beautiful friend. Hugs! Love the way the little adobe is tucked away in its own little walled garden. Cozy and irresistible. Lots of texture here in vegetation and stucco. My idea of a perfect retreat! Feels like a safe haven!